Wark On - LFChistory - Stats galore for Liverpool FC! John Wark’s name, reputation and career command respect. Even though his professional playing career ended a decade and more ago, this book is a fascinating summary of an outstanding club career with Ipswich Town, Liverpool and Middlesbrough. Few successful sportsmen or sportswomen could write a book without the help and expertise of a local and trusted journalist. John is not the exception to that rule and makes full use of the writing talents of Mel Henderson who for two decades was the chief sports writer of the Ipswich Evening Star newspaper. If you can persuade as eminent a football personality as Kenny Dalglish to write the foreword to your autobiography, then it is abundantly clear that you must have done something right! Kenny talks with fondness and respect about John Wark the footballer and John Wark the man. As an established player at Anfield when John arrived on Merseyside in 1984, as a team-mate for both club and country and as the manager who sold Wark back to Ipswich four years later, there are probably few in the game who know Warky better than Kenny. In return, John speaks almost reverently about the honour of playing in the same team as a true football legend. Even though Bob Paisley had retired as manager a year before Wark’s move from Ipswich, he still worked with Dalglish during John’s spell at Anfield. On the front cover of this book is a Paisley quote that shows how highly the famous Liverpool manager rated John Wark. It says simply: “John Wark has great timing. You could set your watch by him”. Above all else, this is an honest book. Wark talks openly and frankly about many things that he experienced as a child and adult, both good and bad. The reader certainly learns a few things he didn’t know before and remembers just as many he thought he had forgotten. Some in the former category come as a surprise; and some in the latter category come as an inspiration at the way this man battled against negative aspects of his life/career and came out on the other side relatively unscathed. The book runs along nicely chronologically. Born in Glasgow in the summer of 1957, John Wark talks with affection about the early part of his life but also pulls no punches about the difficulty of growing up with an alcoholic mother who eventually died at the relatively early age of 57. Although Life was sometimes tough, football was in his blood from an early age. John seemed to know even at a young age that there were other tools he would need to learn to use to make a success of his life as an adult. John supported Rangers as a boy, relatives took him frequently to matches at Ibrox and one of his big regrets is that he never got to play for the 'Gers. Ipswich had an excellent youth set-up at the time and had won the F.A. Youth Cup in 1973, a couple of years before John arrived in East Anglia. They would do so again in 1975, this time with John being a member of that successful team. He had settled in well at Ipswich and was already enjoying a lively if sometimes frenetic social-life with his peers. Unlike many in their late-teens, however, he had no great desire to drive, especially after a horrific car-crash on the way to training one day in a vehicle being driven by Kevin Beattie, from which all four occupants miraculously emerged with barely a scratch. But “the crash affected me so much that it was a further ten years, by which time I was a Liverpool player, before I could even think about learning to drive”. Terry McDermott in vicious mood vs John Wark and his teammates in the 1976-77 season. The arrival of Arnold Muhren and Frans Thijssen from Holland in 1978 and 1979 respectively did much to ensure that Ipswich would become a respected and feared opponent in European competitions as well as in the domestic game. Both men did much to help Ipswich to the UEFA Cup in 1981 but surely no-one did more than John Wark, who scored an astonishing 14 times in 12 matches during that successful cup-winning season. “For a midfield player to score more goals than games played in a top competition like that was simply unheard of” - Kenny Dalglish. Indeed it was and it was neither a fluke nor a surprise when John was honoured by being named the P.F.A. Player of the Year in the same season. He was also voted European Young Player of the Year. A couple of years later and with Ipswich still not having made that big breakthrough domestically, John Wark made a move to a club that certainly had … Liverpool. Ipswich in fact were third from bottom of the First Division when John made his move to Merseyside in March 1984. He wasn’t desperate to leave Ipswich but clearly Bobby Robson’s move to take the England job was a factor, as were his wages: “I felt that I deserved to be paid more but Ipswich refused and that prompted me to ask for a transfer”. Wark adds: “To join a club like Liverpool was an opportunity I had earned – and one I should most certainly grasp”. Staggered by how brief, simple and uncomplicated his 1984 medical had been before he could be confirmed as a Liverpool player, John remembers that “I was amazed how easy the training was at Liverpool. I loved the training because it consisted of five-a-sides and more five-a-sides”. On his arrival on Merseyside John had been placed at the same hotel as summer arrivals Jan Mølby and Paul Walsh. Almost inevitably because of the culture at the time, the trio didn’t waste time finding out what the city of Liverpool had to offer in terms of its nightlife. This wasn’t anything new to John: “If there had been a League championship for drinking in the 70s and 80s, Ipswich Town would have been among the major contenders. I found absolutely no difference after I was transferred to Liverpool in 1984. They were a match for anyone when it came to knocking it back”. Mark Lawrenson later referred to John Wark as “our champion beer-drinker” while Mølby said of Warky: “He had hollow legs”. Wark took part in 62 matches in 1984-85 as Liverpool tried to defend their domestic and European titles. On the home front they were thwarted by Everton but on continental fields they advanced to yet another final, their 5th in just 9 seasons. John scored 27 goals (one more than Ian Rush!) during an eventful season that would end with another of his dreams being achieved but not in the way he or anyone else wanted. “I was to play in a European Cup final. But when I look back on my time in football, and in particular my appearance in what is unquestionably the biggest game of them all, it is as if I am staring at a blank page in a book”. Enjoying the training at Melwood did not make John Wark any less susceptible to injury. A damaged Achilles while training and a broken ankle when back in first team action were heavily responsible for the low number of matches he played in his 2nd and 3rd full seasons as a Liverpool player, just 18 in 1985-86 and one less in the following season. John had to make a major decision about where his future lay. “Hard as it was to depart Anfield – I knew it was the right thing to do”. His former manager and mentor Bobby Robson advised him: “Money isn’t everything. Go where you will be happiest”. Happiest was Ipswich Town, even though by then they were in the Second Division following their relegation in 1986. During his second spell at Portman Road, Wark's eye for a goal remained as strong as ever, as did his competence as a penalty-taker after being successful with 38 out of 43 spot-kicks during his first spell with the East Anglian club. Despite being voted Player of the Year by the Ipswich supporters more than once, his wages at the club again became a stumbling block in 1990. He accepted an offer from Middlesbrough that “dwarfed what I was offered at Ipswich”. Wark only fulfilled one year of his two-year contract and became an Ipswich player for the third time at the age of 34. By this time he had moved back to the centre of the defence and was a key figure in his club’s return to the top division, shortly to be called the Premier League, at the end of the 1991-92 season. It was a season that also saw him make an emotional return to Anfield in the F.A. cup competition. Forced to come off with severe cramp towards the end of a pulsating match that Liverpool won 3-2 after extra-time, Wark was moved to tears by the thunderous reception the home supporters gave him as he left the arena. John made his final three appearances for Ipswich in the 1996-97 season before hanging up his boots after playing 826 appearances and scoring a staggering 223 goals, to which can be added 29 full Scottish caps and 7 international goals, that total including all three matches and two goals for his country at the 1982 World Cup in Spain. Interestingly – because it’s usually a closely-guarded secret – the book has a chapter called “Money, Money, Money”, in which John Wark reveals the salaries and bonuses he was on at the three League clubs he played for in England. He also devotes some time to his role in the 1981 film “Escape to Victory”, filmed in Hungary and for which he received £1,000 per week. Looking back years later, he is still amused (and perhaps a bit offended?) that some people seem to remember him more for his role than for anything he achieved on a football field. Let’s be fair. What John Wark achieved on a football field was considerable. Continuing to play in a local amateur league in Suffolk past his fiftieth birthday, he become a manager at that level yet still showed the same enthusiasm and desire as he did as a boy in Glasgow nearly half a century ago. 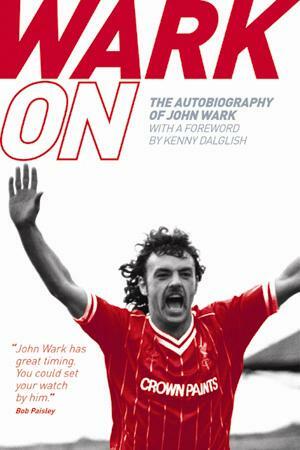 You don’t have to be a supporter of one of the clubs John Wark played for to enjoy this book. It’s the story of a boy’s dream that came true. It’s a story written with incredible honesty considering the high-profile sportsman he became. It’s a story of a God-given talent that was nurtured to fruition by great men like Robson, Fagan and Dalglish. I’ll let one of those men, the modest and hugely-missed Sir Bobby Robson, have the last word in my review. John Wark became “the finest goalscoring midfielder of his generation” – and indeed how true that is.